Disney Pixar’s film, Up, is so beautiful, so poignant, and so adult in its messages on life, love, loss, grief and the memories that sustain us. Although I suspect that most readers of my blog are fans of Disney, even if you do not share my passion or are not a lover of animation, I highly recommend that you watch this film. I also recommend that you have tissues nearby when you do. I relate so strongly to this clip, in which Carl looks at his deceased wife Ellie’s scrapbook. I, too, am surrounded by the blanket, towel, calendars and framed photos, as well as nostalgic items that keep Ben with me. As you see at the end of the clip, Ellie wrote “Thanks for the adventure. Now go and have a new one.” Although I have begun the process, I have had a hard time turning the page of my scrapbook and filling the blank pages with adventures that do not contain Ben. Just as Carl does throughout the film, I look at and talk to Ben’s chair, I ask him questions, I do things that he would have done and buy things that he would have liked. That has kept him close to me. Carrying Ben in my heart is positive and comforting amidst the sadness and unsettling feeling of experiencing life without him. Lately, however, I find that I am feeling a lot of anger. I am angry at the things that he is missing, the life he was cheated of, and the time that was taken from us. As I have written in prior posts, summer is always emotional for me because Ben spent his last summer in the hospital, ultimately choosing to separate from the ventilator at the end of August, 2015. Anger is a new phase in my grief. It’s very upsetting and I’m trying to fight it with gratitude for the time that we did have. Last summer, I struggled to push myself to make some plans. It was uncomfortable, but I specifically made plans to be with good friends, which was something I did miss when I was a caregiver. It was a good summer and, the truth is, I spent a lot of it talking about Ben. As this summer approached, I was proactive in planning. I did not feel the same dread of summer because I have come to accept the ebbs and flows of grief and I know that my thoughts will simply drift to the memories of that last summer in the hospital. I knew as I began to make summer arrangements that I would miss Ben and that things would not be the same, but I have been integrating those feelings into my daily life. 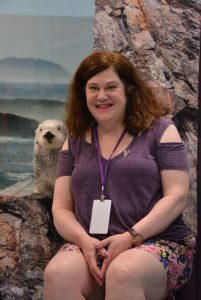 I have long been wanting to meet and interact with otters and penguins, and I discovered that the Georgia Aquarium had encounter programs with both of these cuties, and even with dolphins, another love. So, I decided to follow my whimsy and make one of my dreams come true. I booked a two-day trip to Atlanta to meet the animals I plaster all over my Facebook page. I went by myself, which, I think, was a statement of independence to myself that I needed to make. This excursion might not seem like much of an adventure, but for me, it was pretty monumental. This was not my first excursion without Ben. I went to London in 2016, but London was a place that was special to me way before I knew Ben, and we never went there together. I wished he was there and I had moments of loneliness, but I went to Abbey Road because of his love of the Beatles, truly feeling his presence there, and I took pictures of things that I saw through his eyes, although I’d been to England many times. I did make a dream come true when I went to Washington, DC this past spring to see the cherry blossoms in bloom. It was bittersweet because it was our anniversary and I knew that Ben would have loved visiting the monuments, and I missed him but carried him in my heart, seeing everything through his eyes as if he was walking beside me. I have noted each of these excursions as milestone in my grief and some form of progress, though there was a sadness and loneliness in everything. My adventure in Atlanta was the first time that I felt anger. As I walked through the Aquarium, which truly immerses you in undersea life in the most wonderous way, I not only missed Ben, but I was angry that he was cheated out of experiences like this. 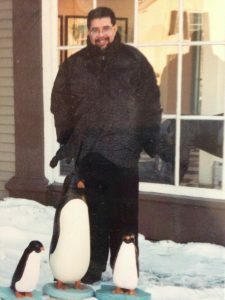 I remember going to the Boston Aquarium by myself and crying when I saw the penguins because it wasn’t the same without him. Nothing was. I had moments of tears at the Shedd Aquarium in Chicago last summer thinking about how Ben would have loved the dolphin show. I even bought a tiny snow globe at the aquarium and I placed it on a shelf that I have filled with special things of Ben’s so that, wherever he is, he knows that I am always thinking of him. But at the Georgia Aquarium, as I marveled at the glass tunnel with fish above and to my right and left, I wanted him to be as mesmerized as I by this magnificent place, delighting in the river otters and the sea otters, and giggling with him as the penguins waddled around and belly-flopped into the water. We would have joked about the turtles, recalling our loving inside jokes. He would have been as thrilled as I was to see all of the animals in the magnificent setting. I noticed how attentive the aquarium was to people with disabilities, with designated viewing areas for people in wheelchairs, and Ben would have loved scooting around the space. This time, I was not just sad, I was infuriated that Ben could not enjoy this and that we could not enjoy it together. I had conversations in my head with Ben, took tons of pictures as he would have done, and looked at everything as if he was with me, but my emotions were different this time. It’s just not fair that ALS cheated him out of so much life. It was a difficult decision to register for the penguin encounter in Atlanta. Ben and I loved penguins. 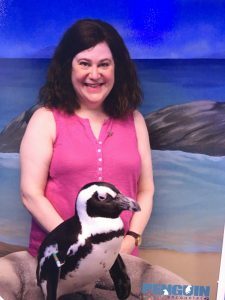 Our first weekend getaway was to Mystic, Connecticut and we loved the aquarium there. We absolutely adored the penguins, who were a part of the dolphin show. Penguins became very special to us and we had all kinds of penguin-themed memorabilia. I had arranged to take Ben to a local aquarium for a penguin encounter for his birthday in 2015. I booked an ambulette to take us and even an accessible hotel room in the hotel next door to the aquarium. The aquarium was kind enough to make special arrangements to accommodate us because the penguin exhibit was not wheelchair accessible. Unfortunately, the winter weather was brutally cold and Ben was afraid to go outside. Most unfortunate was that we never had another opportunity to make that trip. Ben in healthier days in Woodstock, Vermont, 2001. We loved it there. As much as I wanted to be face to face with a penguin, I found myself asking if I should participate, when Ben could not. Would I even be able to enjoy it without him? I decided to register and just go with my emotions. I did not exactly feel guilty about it, but I did not feel entirely comfortable with it either, and this is frustrating. Through a series of events, I ended up doing the penguin encounter twice. The groups in all of the encounters were small- a couple of families and couples. I wanted to be one of those couples with Ben. Greeting and touching the penguins was exciting- they are adorable and fascinating and I loved seeing the bonds between the animals and their trainers. All I could think of was how much Ben would have loved meeting a penguin. I let myself participate as if I was participating for both of us. I know the clichés about life not being fair and Ben wanting me to be happy. I believe that he was watching. And, I have to believe, as Ellie wrote, that Ben wants me to have new adventures. Unfortunately, this was an adventure that we were supposed to have had together and that made it harder to enjoy with abandon. When I saw in the gift shop a bag of jellybeans called “Penguin Eggs,” I had to take a picture- as I know Ben would have done- we loved jellybeans, and I know that he would have forever more called jellybeans “penguin eggs.” In my head, I will smile as I do that, too, and I will think of Ben and know that he is watching and smiling. I am determined to fight the anger. The dolphin encounter was bittersweet. The first dolphin show Ben ever saw was during our first getaway in Connecticut, at the aquarium in Mystic and it was a blast. 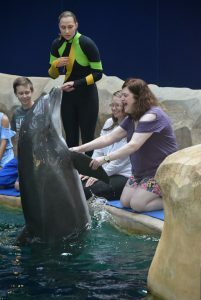 I had seen other dolphin presentations but seeing this one with Ben was particularly fun because he and I unabashedly let our inner children shine. I did feel his presence during that encounter and I believed that he was watching me. I know that some people do not believe in this, but I do, and it gives me comfort. I shared my joy with him and kept him with me in my heart, so he felt a part of the experience. I made mental notes of how he probably would not have been able to get to the training area and pool because they did not seem to be accessible. Then, I thought about how, just as he did in Walt Disney World, Ben would have focused on what he COULD do rather than what was not possible. He would have been enraptured watching the dolphins in their habitat. Otters are my thing, but Ben would have been happily teasing me and celebrating my joy. I seem to be able to enjoy things more if I feel like I am sharing with him. Maybe I’m deceiving myself, maybe it’s just a way that I cope with my exasperation and sadness at his absence. 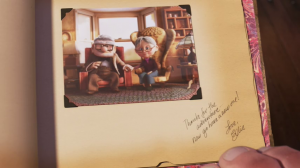 When I watch Up and see Carl and Ellie get old together, I have a hard time recovering from the tears. Before his ALS diagnosis, when Ben saw elderly couples holding hands and strolling along, he would always comment that one day we would look like that. When I watch Carl talking to Ellie after she is gone, greeting her photograph and looking at her chair, I see myself and how I still look at Ben’s chair and talk to him, and greet his picture that is my laptop background. I’m not comfortable with this angry phase that I’m experiencing. I prefer to focus on Ellie’s, “My Adventure Book” and revisit the pages of my book that Ben filled with so many memories and much love- even during the ALS days- and know that those pages will never disappear or be erased. Ben and I never talked about what my future would look like without him. On occasion, he would laugh and say that if I ever met anyone else, that he would haunt me like the Grim Grinning Ghosts at Walt Disney World’s Haunted Mansion. We never seriously talked about it. So, I’m on my own trying to carve out a future that gives me joy and honors Ben’s memory. 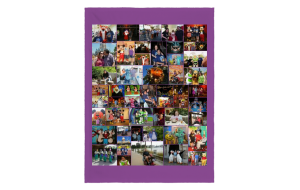 Just like Carl, even though I am struggling with old and new emotions as I move forward, and I need to keep Ben very present, I am filling the pages with new memories. Up makes me cry a lot, but it is a beautiful film with a lot of hope. The positive perspective it lends to grief and to living with and past a painful loss can help lift you Up! I also recommend the Georgia Aquarium and its encounter programs. It may not have a castle, but it is a magical place!